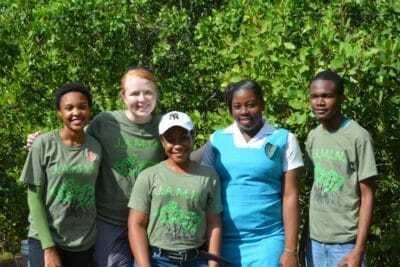 With the school holidays behind us, we returned to The Bahamas and Jamaica in mid-January for the second phase of the Mangrove Education and Restoration Programs. During these trips, I was accompanied by two special guests – our intern Maggie Dillon and Nevada Winrow our partner at the Black Girls Dive Foundation. Maggie assisted me with the J.A.M.I.N. program and gained a wealth of knowledge about conducting environmental education, while Nevada joined me in the Bahamas to observe our B.A.M. program to find out how we can incorporate it into her programs. Living Oceans Foundation’s intern, Maggie Dillon, takes a moment to pose for a photo with second year J.A.M.I.N. participants from William Knibb High School. Nevada and Maggie couldn’t wait to experience the year 1 B.A.M. and J.A.M.I.N. programs. During these programs, we focus on teaching Biology 10th grade students about the mangrove food web. We not only discuss the role and trophic level of organisms in this ecosystem, but we also provide opportunities to classify the organisms into their correct phyla. We use a hands-on approach to learning about food webs by bringing organisms that live in the mangrove ecosystem into the classroom. For Nevada and Maggie, it was exciting from them to see the students identify, touch, and hold some of the animals that we bring into the classrooms. This is the first experience for many of the students to observe these organisms. Education Director, Amy Heemsoth explains the features of a sea biscuit to J.A.M.I.N. students from St. Hilda High School. Additionally, we implement an activity that allows the class to literally “string” together a mangrove food web. Standing in a circle, students pretend to be an organism in the food web and after they decide their trophic role, they pass the string (representing energy) to the student (different organism) who preys on them. By the end of the activity, there are strings zigzagging in every direction around the circle and the students have created a mangrove food web. For Maggie, this was the perfect opportunity for her to interact with the students. 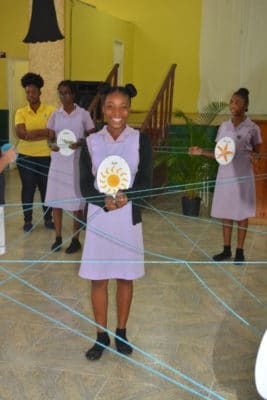 Students from St. Hilda High School form a food web as part of a J.A.M.I.N. activity. As part of the B.A.M. and J.A.M.I.N. year 2 programs, we continue to monitor mangroves with 11th grade Biology students. Nevada was especially interested in this activity. As part of the program, we return to the mangrove site that the students restored in the first year and with their groups, the students find the 5 x 5 meter squared quadrats that they set up during the first phase. For a second time, the students collect non-living environmental data such as pH, temperature, dissolved oxygen, and salinity inside their quadrat. The students then learn a new field technique – they learn to tag and measure the mangrove trees in their quadrat, which are the living components. After a third trip to the mangroves, students will analyze this data to come up with a management plan. Nevada especially liked our project-based approach to learning science. 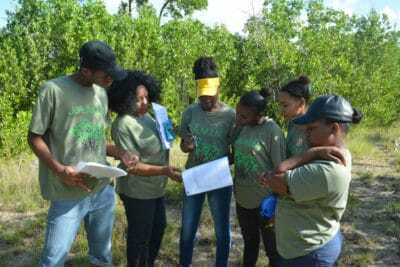 Students from William Knibb High School use scientific tools to measure various non-living factors in their mangrove quadrats. 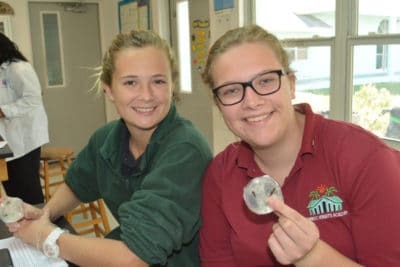 Another exciting component to the year 2 program is teaching students about mangrove disease. 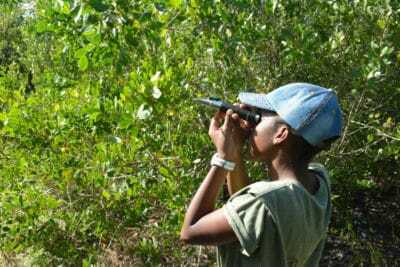 In collaboration with our partners at FRIENDS of the Environment, we have partnered with scientists at North Carolina State University Department of Applied Ecology to provide students with an opportunity to participate in a mangrove citizen science project. There will be more information about this in the following blogs. 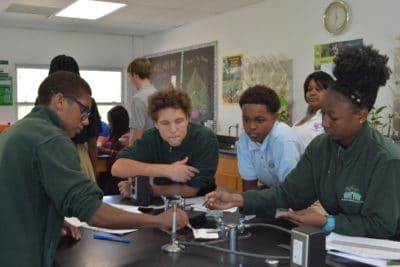 Forest Heights Academy students dissect their mangrove leaves and plate them in agar. 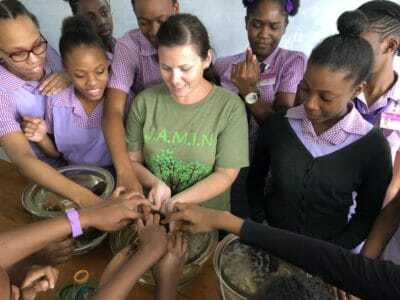 It was a pleasure to have Nevada and Maggie join us during phase two of the Mangrove Education and Restoration programs. We look forward to future collaboration with the Black Girls Dive Foundation and Maggie interning with us until the end of the academic year. Keep following our blogs for more information.